This post will describe the electronics I used to drive and control the LEDs for my element display. These were designed by my good friend and very skilled electrical engineer Bill Porter (www.billporter.info) and built by him and myself. To read about the project as a whole, see the introductory post. I’m not an electrical engineer, but I will try to describe what I can here. Bill has a much deeper knowledge of this sort of thing, and has posted a much more in-depth article about how all this works on his website, which he has dubbed the Elemental Illuminator. This post will describe the LED lighting scheme I used to illuminate my element display, including where I sourced the LEDs, how they are attached to the backboard, and the table’s overall color scheme. To read about the project as a whole, see the introductory post. 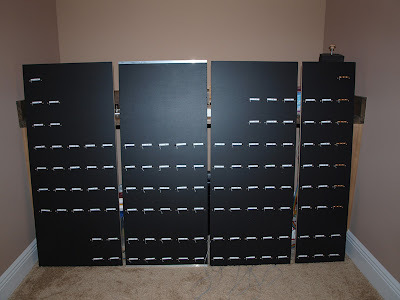 This post will go into detail on how I assembled the individual acrylic shelves for my element display, including where I ordered the plastic and the process of attaching 240 shelf pins to the 120 shelves. To read about the project as a whole, see the introductory post. 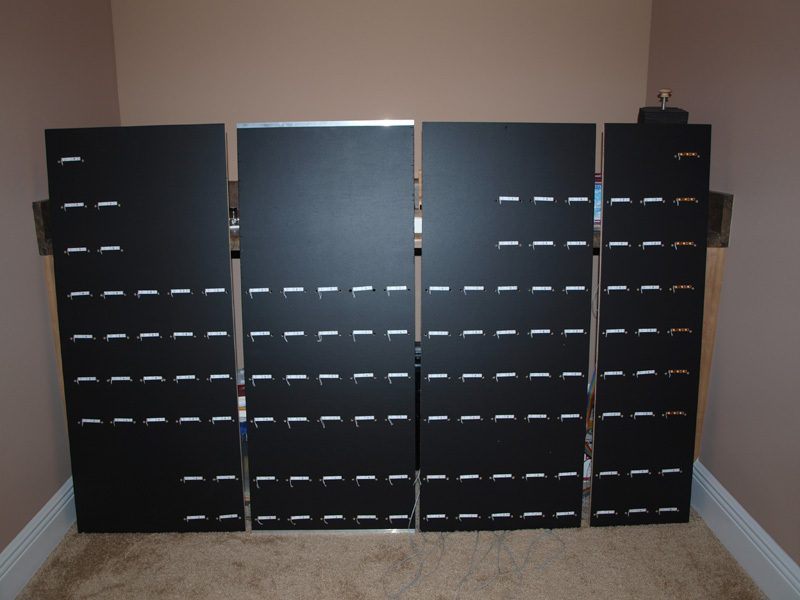 This post will go into detail on how I constructed the backboard for my element display, including cutting it into sections to make it transportable, drilling the required 360 holes, and attaching the sections together in the final configuration. To read about the project as a whole, see the introduction post. For a very long time I have been interested in the hobby of element collecting. That is, collecting actual samples of elements from the Periodic Table. It's amazing to me that it is possible to possess all the building blocks for every piece of matter in the universe! This desire to start an element collection was actually what got me started as a home chemistry hobbyist in the first place. In fact, many of my experiments have the ultimate goal of isolating a pure element to add to my collection. While there are currently 118 elements discovered, it’s generally agreed that only the ones up to Uranium (92) are collectable (but it’s actually possible to get a few more than that, thanks to smoke detectors!). All elements heavier than Uranium, and a few lighter ones too, have no stable isotopes – they are radioactive and will eventually decay into lighter elements. That leaves a total of 95 samples to collect (including Am). I've steadily grown my collection over the years, and now it's become large enough where I wanted to build a nice display case for it. This project has taken me many months to design and construct, and has evolved through a lot of different concepts and iterations. The idea quickly grew from a simple shelving unit to one that included programmable LED lighting, shelves arranged in the shape of the Periodic Table, and the ability to be broken down easily for transport. This was a massive undertaking, and even the simplest alteration required tons of work to propagate through the entire display. It has been an incredibly rewarding and very fun experience, and has taught me a lot of handy skills like painting, soldering, and carpentry in the process. I spent three months designing it, built three prototype small-scale versions, and spent another 13 or 14 months constructing it off and on during my free time. Below is a video of the finished product and a summary of how I put it all together. Much more detail can be found in the following posts here on my blog.